On Thursday, 11th April, in France, 9 trade unions and associations have called for demonstrations in defense of pensions. These organisations have for years been coordinating the resistance of pensioners before the continued attacks of governments and in defence of their demands. 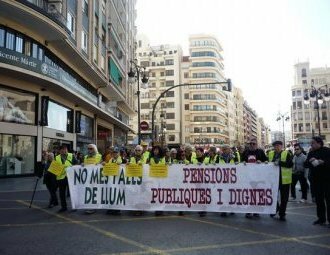 On Saturday, 13th April, in Spain, the Coordination in Defence of Pensions has called for demonstrations as well. The Coordination has already organised important demonstrations, also to confront the attacks of governments and in defence of the demands of pensioners. The organisations that are part of the International Labour Network of Solidarity and Struggle, and their own structures or groups of pensioners, support this mobilisations. We call for the organisation of rallies before the French and Spanish embassies and consulates and the sending of communications in support of the French and Spanish organisations. For both France and Spain, as indeed for any other country, we demand a system of social protection that is social, public, universal, supportive, and which guarantees incomes that enable pensioners to live a decent life. Retirement pensions should never be lower than the minimum wage of a country. The employers organise unemployment. In opposition to this, we must impose a reduction of the work time, including a lower retiring age and a reduction of the number of years needed to get a full pension. This can be done if we take from the employers part of what they steal from our work. If we reduce their benefits there will be more than enough to satisfy our demands. These are political decisions. They are decisions about the type of society that we want. The 11th and the 13th April we will support the pensioners that will demonstrate in France and in Spain. Their struggle is part of the overall working class struggle. For they, too, have a weight in the configuration of international power relations.